Cooper DeVeau caught the game-winning touchdown pass in overtime to give Xaverian an overtime win over Catholic Memorial. To say week four of the MIAA football season was the most exciting to date would be an understatement of immense proportions. Between wild finishes, unforeseen upsets, and highlight performances, week four brought everything that players, fans, and coaches around the state adore about high school football. No. 23 Acton-Boxboro provided the biggest shocker of the weekend with quarterback Finn Murray completing a four-yard touchdown pass to Victor Otero at the buzzer to give the Colonials a stunning 37-35 win over No. 2 Lincoln-Sudbury. Not to be lost was the effort from Warriors’ quarterback Braden O’Connell’s . O’Connell threw four second half touchdowns to lead L-S back after they fell behind 28-0. 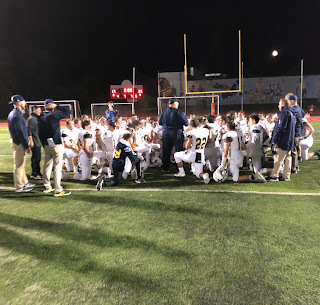 Elsewhere, Xaverian overcame an early 17-0 deficit to defeat Catholic Conference rival Catholic Memorial in overtime, 25-17. 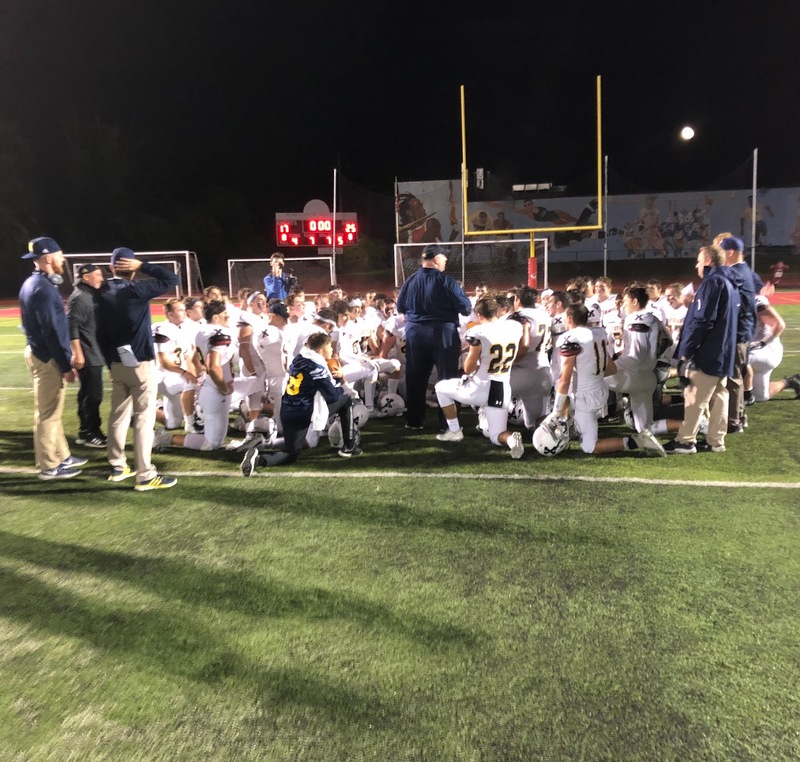 The Hawks tied the game with less than two minutes to play on a 30-yard field goal by Justin Wenstrom before winning in overtime courtesy of a 10-yard touchdown reception by Cooper DeVeau. In a wild finish, No. 7 Mansfield halted No. 13 King Philip's two-point try with just 30 seconds remaining to hold for a 28-27 win. It’s the Hornets first win over the Warriors since 2013. To cap it all off, St. John’s Shrewsbury overcame a 31-14 deficit against Wachusett, with Colin Deso coming through with the game-winning pick-six to give the Pioneers a much needed, 38-31 win. To finish off our content from week four, here are our top 10 performances from this weekend’s slate of MIAA football games. In the biggest upset of the season to date, Murray was nothing short of impeccable. The Colonials senior quarterback threw for 256 yards and four touchdowns, including connecting with Victor Otero at the buzzer to lift Acton-Boxboro to a 37-35 win over No. 2 Lincoln-Sudbury. Murray also rushed for 129 yards on 14 carries. For the first time this season, we have two top performers from the same team with Otero proving to be Murray’s favorite target throughout Friday night. Otero finished with over 150 receiving yards, and three touchdowns - including the game-winning score as time expired - as part of the Colonials' win over Lincoln-Sudbury. As he has throughout Mashpee’s winning streak, Ford stepped up when the Falcons needed him most. Ford finished with three total touchdowns, 200 all purpose yards, and a pair of interceptions to lead No. 9 Mashpee to a nail-biting, 21-20 victory over Abington. The Falcons have now won 24 consecutive games. Bianchi threw for 200 yards and three touchdowns, while also rushing for 140 yards and three additional scores to lead Lexington to a 42-28 win over Winchester in a Middlesex Liberty battle. The loss is Winchester’s first of the season. Deso completed an improbable second-half comeback for St. John’s as with Wachusett going for the game-winning score, the senior defensive back intercepted a pass and returned it 76 yards for the touchdown to lift the Pioneers to a 38-31 win. DeVeau was the focal point of No. 4 Xaverian’s second half comeback against No. 3 Catholic Memorial. The Hawks’ senior captain intercepted pass, hauled in a 44-yard reception on the game-tying drive, and caught the game-winning touchdown in overtime as the Hawks defeated the Knights, 25-17. Severance finished 18-of-22 for 338 yards and three touchdowns as Lynn English defeated Saugus in a Northeastern Conference Tier 3 shootout, 42-35. The Wildcats’ senior quarterback threw three touchdowns and ran for another to lead Milton to a much-needed, Bay State Herget win over Walpole, 34-16. McMenamin now leads all Division 4 passers with 11 touchdowns on the season. Inzana was sensational all Saturday afternoon for Swampscott, completing 19-of-27 passes for 340 yards and four touchdowns as the Big Blue took down Salem, 36-21. The Westfield offense continued to roll on Friday night with Moynihan working as the catalyst. The Bombers’ senior tailback finished with 20 carries for 191 yards and three touchdowns to spearhead Westfield to a 48-14 win over Agawam.